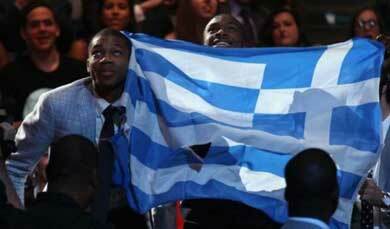 Yiannis Antetokounmpo became in the early hours of Friday the Greek basketball player with the highest placement in the NBA draft after being picked at number 15 by the Milwaukee Bucks. The 18-year-old Greek of Nigerian origin plied his trade at Filathlitikos in Greece’s second-tier league until this season, but has now shot to fame as he is to wear the jersey with number 34 at the Bucks. And yea, no hard feelings that’s what the story is all about, Today I watched a movie “bandslam” about a lonely kid whose gift in music went buried for years until he found someone who really saw the good in him, we all got some gold in us. I would like to mention one my major crushes, I admired this person secretly. Well it was one experience I would never forget, it was after that day I found my love for music. His name is Emmanuel Afolayan, aaaahhh gotcha its not a girl. Okay, he is my cousin on my mom’s side and the day I got stuck to music and instruments was one day in boarding house when everyone in boy’s hostel must have felt that must be the worst day ever but then came this melody, he was playing his recorder and although I cannot remember the songs, I remember the effect it had on all the people in that room and since then I have been a music addict. I went on to struggle through teaching myself the recorder, Harmonica, Clarinet and recently I got my own saxophone!!! Well I am just starting to learn that. Will gist you all as it goes on. Major lesson, watch out for the potential in the people around you and never let go of that gift you have, you never know the effect it has on others. To Nigeria, GET YOUR OWN Back!!! Win our allegiance!!! http://www.ekathimerini.com/4dcgi/_w_articles_wsite5_1_28/06/2013_506349 for the full story on Nigerian turned Greek basketballer.